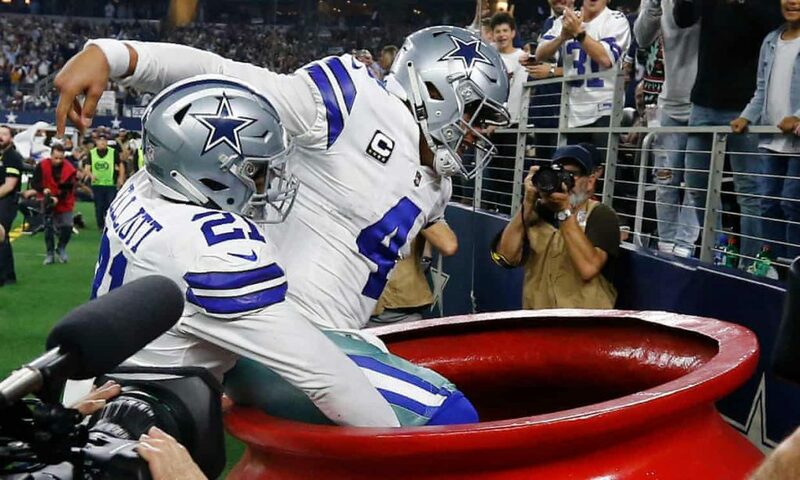 Amari Cooper celebrated his first touchdown with a mock free throw before a 90-yard score that sent him to a Dallas Thanksgiving-record 180 yards receiving, and the Cowboys pulled even with Washington atop the NFC East with a 31-23. Elliott ran for 121 yards as the Cowboys (6-5) won their third straight game since their first home loss, to Tennessee in the Dallas debut of Cooper. Dallas’ eighth win in nine Thanksgiving games against Washington, and second in three years, earned a season split. Washington (6-5) lost for the third time in four games in Colt McCoy’s first start in four years coming off Alex Smith’s season-ending leg injury. The former Texas Longhorns star threw three interceptions to offset two touchdown passes. McCoy won his two previous starts at the home of the Cowboys, one for the 2009 Big 12 championship and the other his most recent NFL victory with Washington in 2014. Chase Daniel outplayed Matthew Stafford, proving an NFL journeyman can beat one of the highest-paid players in the league.Daniel threw a career-high two touchdowns to keep the Chicago Bears rolling with a 23-16 win over the Detroit Lions, filling in very well for injured quarterback Mitchell Trubisky. In the late Thanksgiving game, the Saints continued their brilliant season as they moved to a 10-1 record, tied for the best in the NFL with the Los Angeles Rams. Drew Brees threw just his second interception of the season but more than made up for it with four touchdown passes. The Falcons’ season is all but over after they fell to 4-7 after another tough loss.